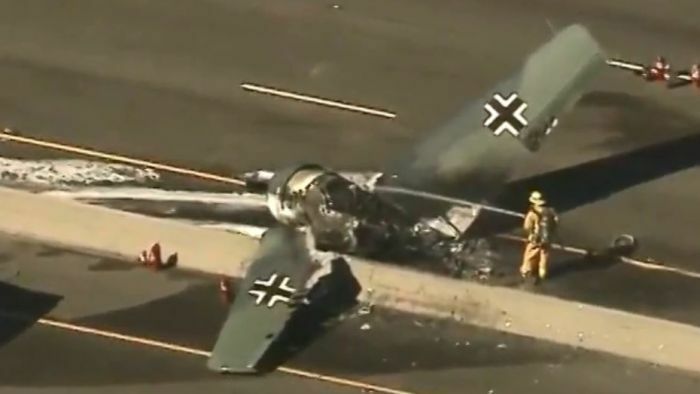 US motorists got a shock when a vintage plane painted with the insignia of Hitler’s air force crash-landed in the middle of a highway in southern California. The aircraft crashed onto the central reservation of US 101 on Tuesday afternoon local time, but according to CBS no vehicles were hit. The pilot, the only occupant of the plane, escaped before the plane burst into flames. It belonged to a non-profit organisation which stages mock dogfights for air shows and performs at ceremonial events. The Balkenkreuz was a variation on the Iron Cross used by Nazi Germany on planes and vehicles. The AT-6 was developed in the 1930s, and was used to train US pilots during World War II. The crash, which occurred west of Los Angeles, slowed traffic to a crawl as the pilot was rescued and fire fighters dealt with the blaze.